Alfred Street, via Bing Maps. All other photos by Matt Harding. 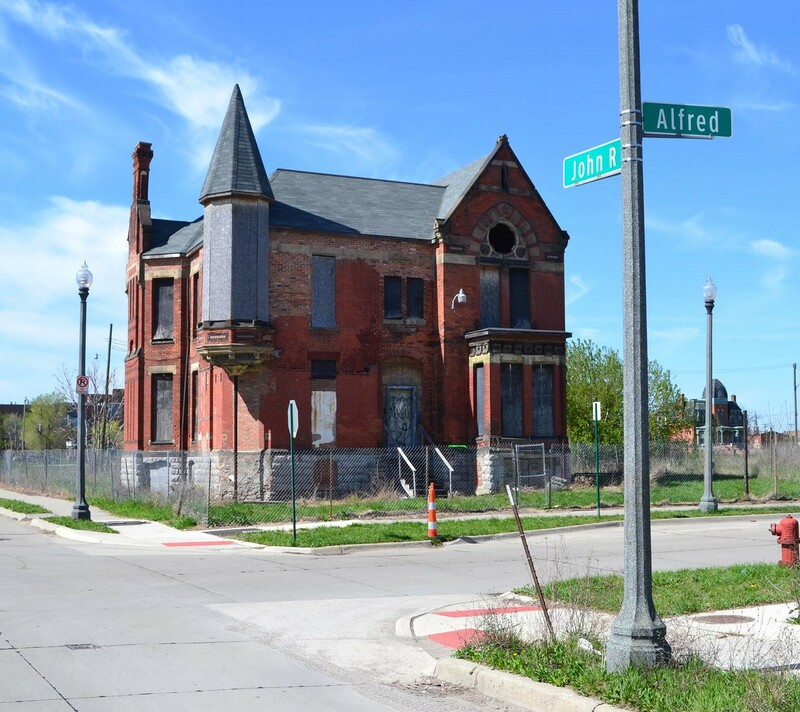 Detroit’s Brush Park neighborhood rose in the mid-19th century as businessmen and other elites in the city began to build their dream homes near downtown. 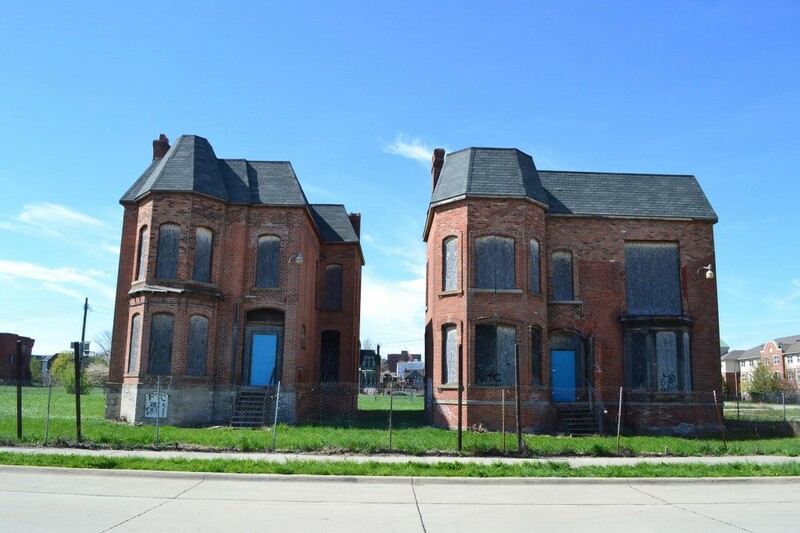 One of Detroit’s first wealthy and architecturally significant neighborhoods, Brush Park experienced a premature demise because of the rise of the automobile. Wealthy residents no longer had to live close to downtown, so they began relocating north to other prominent Detroit neighborhoods, such as Indian Village, Boston-Edison and Palmer Park, while others relocated to suburban communities, like the Grosse Pointes. 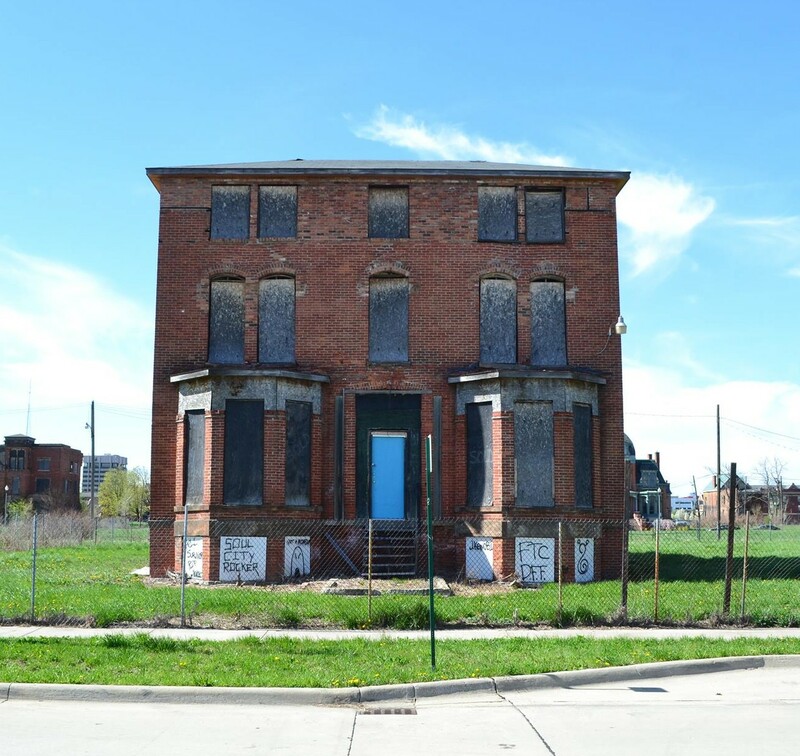 When Brush Park began to decline in the 1910s, the neighborhood saw a shift from single-family mansions to apartments and rooming houses that didn’t receive the same level of care. Nowhere was this truer than on Alfred Street, between John R and Brush. In 1897, Alfred Street belonged to 22 single-family homes. Today, it’s primarily a sprawling field with four remaining but abandoned houses. During its heyday, one of those original homes belonged to Hannah McLauchlin, who was called “the guardian angel of Alfred Street” by the pastor of the First Presbyterian Church at her funeral, according to an excerpt in “Alfred Street,” a book written by her grandson, Russell Jachne McLauchlin. The book, first published in 1946, offers a detailed account of the storied street. Conveyed through essays and short stories, the book recounts McLauchlin’s life growing up at 77 Alfred. He wrote about his grandmother, as well as nearby neighbors, including James D. Standish of 74 Alfred, the Muirs of 76 Alfred, and Thomas S. McGraw of 81 Alfred. McLauchlin recounted that no front porch on Alfred Street was empty on a summer’s evening, including that of Mrs. “Auntie” Muir across the street. He described the “elaborate productions” put on by the Alfred Dramatic Club at the Standish home and wrote about the only Civil War veteran on Alfred Street, “Uncle Tom” McGraw, who also had a prosperous business on Jefferson Avenue. While the book was about Alfred Street’s yesteryears, it also speaks to the early decline of the neighborhood. According to her Michigan Department of State Certificate of Death, Hannah McLauchlin died on Feb. 12, 1904, just shy of her 74th birthday. As early as 1914, 76 Alfred, formerly the home of James H. Muir and “Auntie” Muir, became the Phipps Apartments, according to records in the Detroit City Directory. By 1921, just seven years after the first recorded apartment building arrived on Alfred, all of the homes were apartments or rooming houses, according Sanborn fire insurance maps of the street. Alfred Street was no longer the one that young Russell McLauchlin remembered. 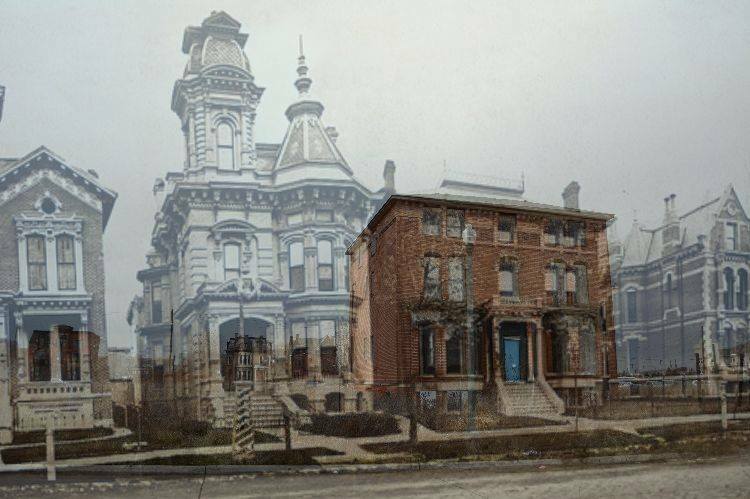 Autoworkers quickly filled up the apartment buildings and rooming houses, and Brush Park lost its majesty. Alfred Street still exists. It runs at right angles to Woodward Avenue, less than a mile from the center of Detroit, just as it always did. It is now in what city-planners call a blighted area. The elms were long ago cut down. No representative of the old neighbor-families remains. The houses, mostly standing as they stood a half-century ago, are dismal structures. Some have night-blooming grocery stores in their front yards. Some have boarded windows. All stand in bitter need of paint and repair. Today, more than half-century later, Alfred Street remains what city planners would call a blighted area. Many of the dismal structures McLauchlin wrote about were torn down long ago, though some within the past couple of decades. Only four houses remain on Alfred Street, between John R and Brush. All have boarded windows. All stand in dire need of more than just paint and repair, but immense rehabilitation. Of the four houses, none is more famous than 63 Alfred (later 205 Alfred), also known as the Ransom Gillis House, which stands on the northeast corner of Alfred and John R.
Gillis sold the property to Alanson J. Fox around 1875, and lived in the home next door (which also was next to the McLauchlins). The house spawned a book, 63 Alfred: Where Capitalism Failed, and has been featured in the movies Beverly Hills Cop (1984) and Four Brothers (2004). Most recently, it was a prominent filming location for the AMC television show Low Winter Sun. The home is arguably the face of urban blight in the United States. Further down the barren street is the James V. Campbell House at 91 Alfred (later 261 Alfred). Campbell, a justice of the Michigan Supreme Court from 1858 until his death in 1890, had the house built in 1877 and lived there until 1889, according to the Detroit City Directory. He lived his final year in Ironwood, Mich., according to an obituary in the Ironwood Times on March 29, 1890. He left the house to his son, Charles H. Campbell, who lived there in 1890. According to later directory records, the younger Campbell left the house vacant in 1891. In 1892, a Mrs. Charles W. Machem, later noted as Mary W. Machem, was the recorded dweller of the home until 1905, at which point the home switched hands numerous times. The other two homes left standing on Alfred Street today are known as the Mansard Twins, named for their French-style mansard roofs. They reside at 287 and 295 Alfred, respectively (formerly 105 and 113 Alfred, respectively). Today, these four homes stood where they did nearly a century-and-a-half ago. The south half of Alfred Street is empty, with the remaining homes occupying the north side of the street. 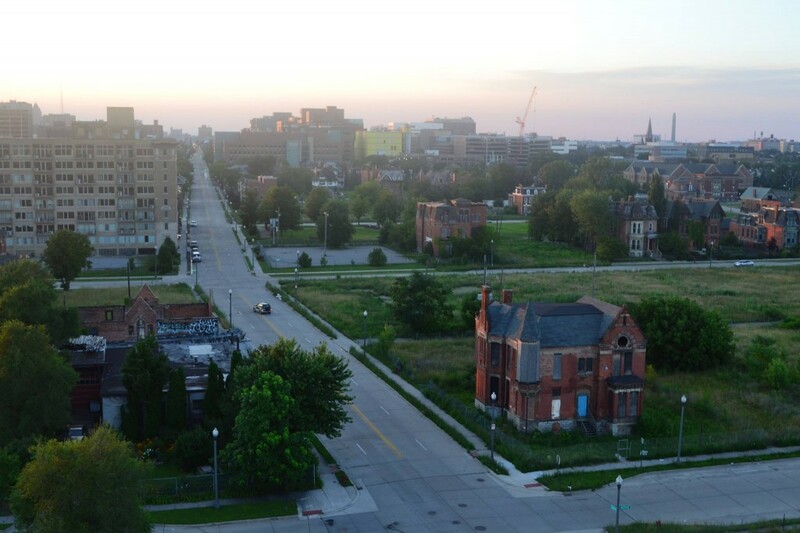 Of the 21 lots between John R and Brush, 20 are owned by the city, which is holding the property until demand for Brush Park property is higher. 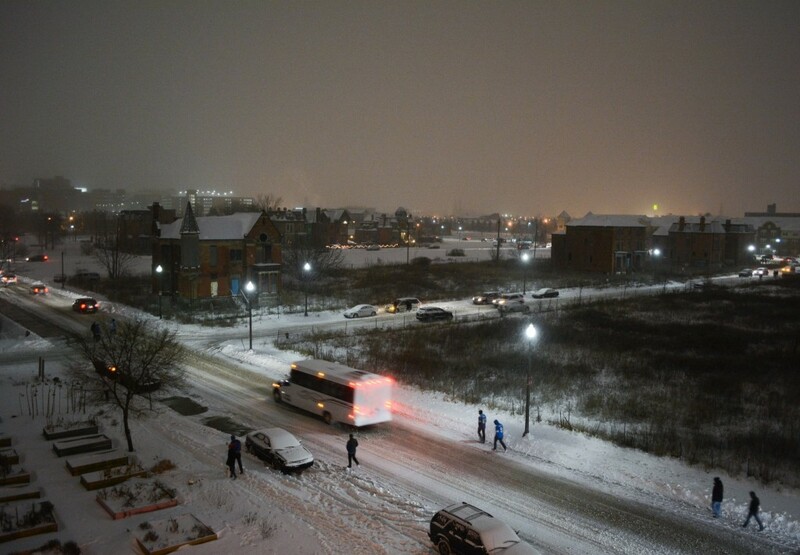 Many others use Brush Park and Alfred Street as a place to park their vehicles for football games at Ford Field and baseball games at Comerica Park. Some fans litter the neighborhood with trash; others stop to urinate in the tall, empty grass. I would bet few stop to see the irony that a street and neighborhood destroyed by the rise of the automobile has become a parking lot. 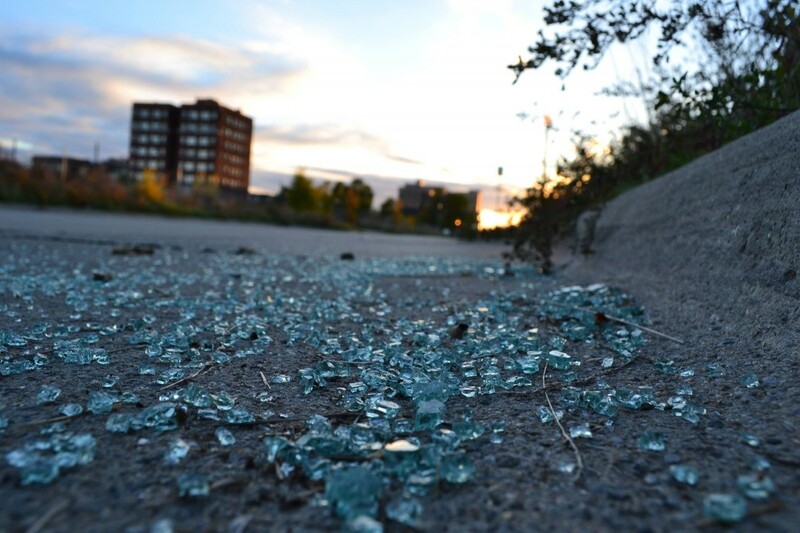 Matt Harding is a third-year journalism student at Wayne State University, a photographer, and a lifelong Detroiter. He has covered major political and sporting events and is the author & photographer of Belle Isle: Discovering Detroit’s Crown Jewel. Matt’s current project can be found on GrandCanyonJourney.com. My grandfather was the manager of the Phipps Apartments in 1940. Indeed, according to the 1940 census, the building was filled with foundry workers, iron workers, mechanics, cooks, metal finishers, and other hard-working folks. Very interesting article. My husband grew up outside of Detroit. I grew up outside of Philly. Detroit was his stomping grounds as Philly was mine. I’ve always loved Michigan and Detroit in particular. Because I grew up in a 200+ year old colonial home and my first home as a young newlywed was a 130 year old victorian I have a great interest in old homes. Brush Park for me has more charm and romance than any other neighborhood I’ve ever been in. I’ve read Alfred Street and it made me feel so melancholy to read how charmed his childhood was on the very street I’ve stood on. You can feel the history of all the families that lived and died there when you walk down Alfred and all the other streets as well. I hope it will be revitalized and the remaining houses will be rescued, restored and loved. Very true. I live in Brush Park also, in between Alfred and Adelaide, and have a great interest in the area…which is what prompted the article. Maybe not all but the aerial view of Google maps shows that most of it is. No it is not, but the majority of the few lone structures that dot the grassy landscape are.